Using your slow cooker to make this Bolognese allows the flavors to build all day without an all-day effort. Sauté the vegetables in bacon drippings to add wonderful layers of flavor. Try chopped pancetta instead of bacon for a slightly different flavor. Per Serving: 670 calories; 43g fat; 26.1g carbohydrates; 38g protein; 168mg cholesterol; 893mg sodium. 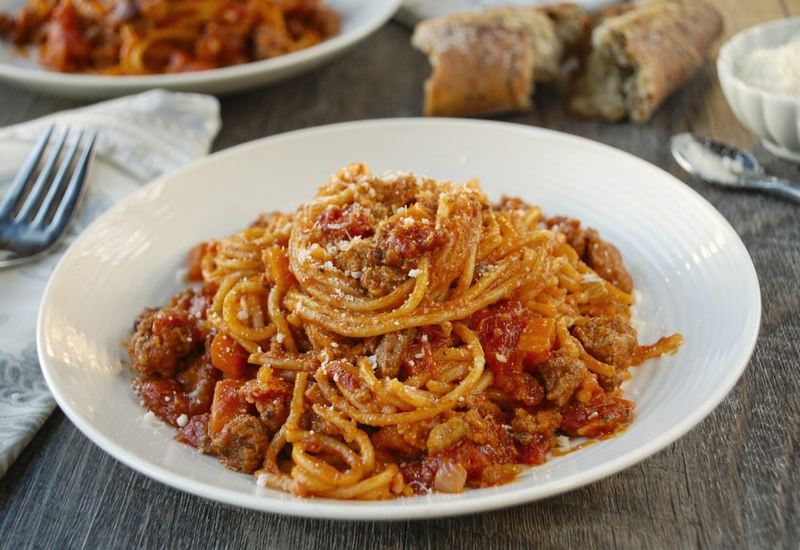 One of the best spaghetti bolognese recipes ever! This dish is so good, it's perfect to make in the slow cooker. We put this on our weekly rotation and the entire family loves it. This spaghetti bolognese recipe is so amazing. I don't eat pasta often, but this is definitely a cheat day favorite. The ground beef and pork may seem excessive, but it truly adds to the flavor of this dish. Shave a little fresh parm on top and you're good to go.